Craftiepants 123...: That Suits Me Just Fine! Father's Day is almost upon us and I thought this card 'suited' the occasion! Sorry, but I just couldn't help myself! This executive attire was created from Night of Navy by Stampin' Up! and the crisp white and red gingham shirt was made by stamping white card stock with red ink using Hero Arts Large Plaid background stamp. The tie and handkie are 5/8" wide satin ribbon. 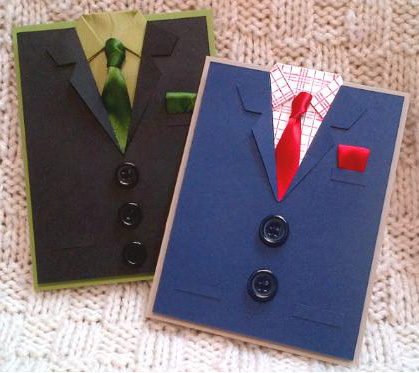 Card making for men can be a challenge, and if you're weary of fishing, trucks and sports, why not dress up this Father's Day! This couture design is a Jackie Topa original, jackietopa.typepad.com, with a few Jen Wong genuine additions. 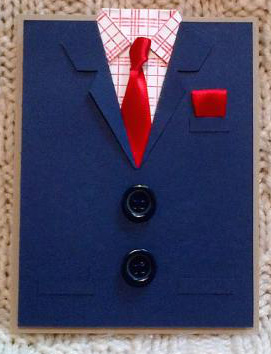 I know one Dad who'll be glad to receive this card for Father's Day, it will 'suit' him just fine! love your masculine cards, have you a template for the just suits me fine card please, and do you have a newsletter too please? cheers and thankyou.